By Scott Gilfoid: Anthony Joshua only has a limited amount of time to make his next fight if it’s going to be against WBC heavyweight champion Deontay Wilder, according to his promoter Eddie Hearn. He’s going to sit down with Joshua (21-0, 20 KOs) in the next couple of weeks and iron out who his next opponent will be. Hearn doesn’t know for sure whether Wilder (40-0, 39 KOs) will be the option for Joshua, because his team still hasn’t made an offer to him. 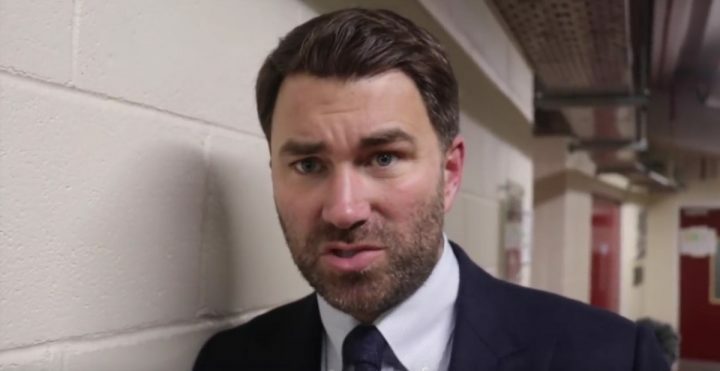 Hearn isn’t saying why he hasn’t made the offer to Wilder’s management for the fight. After all, Joshua is the A-side, so it’s reasonable to assume that he would make the offer. Hearn has already made a fight offer to Deontay to defend against his Matchroom Boxing fighter Dillian Whyte for June. Wilder has made it crystal clear that he is absolutely 100% not interested in taking the fight with Whyte, who he feels won’t do anything for his career. Whyte gave Wilder an offer. Joshua should make the offer to Wilder, because he wants his WBC title to add to his other 3 heavyweight titles he has in his collection. Joshua and Hearn are probably not going to ever get a chance to win Wilder’s WBC title if they don’t make an offer to them. Joshua is the A-side, so he should make the offer. Back in 2015, Floyd Mayweather Jr. was the A-side, and his mega-bout with Manny Pacquiao took place. There are a lot of people that think Hearn doesn’t want to risk his money fighter Joshua against Wilder. He’s riding the gravy train right now with Joshua bringing in the dough, so why ruin it by letting him fight Wilder and possibly wind up flat on his back counting stars? The Joshua-Wilder fight hasn’t happened in the last 3 years despite interest from Wilder, so it’s reasonable to assume that it won’t be happening in 2018. Joshua has too many options available to him for easy fights against Jarrell ‘Big Baby’ Miller, Alexander Povetkin, Dillian Whyte and Tyson Fury. That’s four paydays for Joshua, and he could wind up facing some of those guys in rematches. Parker is also an option for a rematch due to how competitive their fight was. Joshua has enough options to where he doesn’t need to fight Wilder for another year or two if not longer. Wilder isn’t going to give the title away for free so Joshua can become the unified heavyweight champion the easy way. Joshua won the IBF belt easy in beating Charles Martin. Last Saturday night, Joshua defeated Joseph Parker by a 12 round unanimous decision to win the WBO title. You have to wonder how badly Joshua and Hearn really want the World Boxing Council heavyweight title that Wilder has in his possession. ”We have only a limited amount of time to make the fight happen,” Hearn said about the Joshua vs. Wilder fight. ”If there’s a deal to be done and it’s the right deal, then we’ll do it next. No problem. AJ has stated quite clearly he wants to do it in the UK. I think the U.S has got potential, but if the deal is there right now, we’ll take it. If not, then maybe we’ll do a fight in the summer,” Hearn said. The way Hearn seems to be excited about matching Joshua against his WBA mandatory challenger Alexander Povetkin, it would seem that will be the next fight for AJ. Povetkin looked vulnerable last Saturday night in stopping David Price in the 5th round. Price hurt Povetkin in the 3rd round after hitting him with a left hook, and he was given credit for a knockdown. That was one of the rare instances in the fight that Price landed a big shot. For Povetkin to be able to beat Joshua, he’s going to need to take a lot of huge shots. The 38-year-old Povetkin is probably not going to be able to take those shots at his age and with his limited size. ”Tonight was about winning another title, and then we’ll sit down in the next couple of weeks and plan our future,” Hearn said. I don’t blame Wilder. ”He’s a desperate man. He’s saying things out of desperation, and he’s lost the plot, because he has no idea what’s happening to his career. He has no idea who’s talking on his behalf. He has no idea what’s happening next. He has no plan in his career whatsoever, and he just travels around everywhere to the important places like here,” said Hearn. What Hearn is talking about here is the comment that Wilder made last week about wanting to add a dead body to his resume. Hearn doesn’t believe Wilder was serious in saying that, but he does feel that his career is rudderless, with no direction and going nowhere. Hearn feels that Wilder is desperate for the Joshua fight. Wilder definitely wants the fight because it’s the biggest payday he can get. It’s also a fight that Wilder wants so he can show the boxing public that he’s the best fighter in the heavyweight division today. Hearn seems to believe that if he was in charge of Wilder’s career, he could turn him into a big star. It’s unlikely he’d be able to do that unless he had him fight exclusively in the UK, and if he made it clear to the British boxing fans that he had added him to his Matchroom Boxing stable. Deontay Wilder doesn’t have enough big names for him to fight in the U.S for him to become a big star there. Hearn would have to keep Wilder in the UK and fight him all the time there if he wants to take his career to the next level. Hearn probably wouldn’t do that though. He would likely use the same strategy he’s using with American middleweight contender Daniel Jacobs in fighting him in the U.S against weak opposition while trying to angle him towards a title shot against the winner of the Saul Canelo Alvarez vs. Gennady Golovkin 2 fight. It’s unlikely Jacobs will ever become a huge star in the U.S. Wilder is popular, but he’s not a PPV attraction in the U.S the way Joshua is a PPV star in the UK. It’s easier to be a star in the UK than it for a fighter to become a star in the U.S, because the UK fans rally more behind their fighters than Americans do. Maybe it’s true what Hearn says. It’s possible that Joshua would have called Wilder into the ring after the Parker fight last Saturday night, but given that Deontay was given an alert by his team that he wasn’t going to be able to enter the ring, it makes all the sense in the world that he decided not to travel to Cardiff. It would have been nice if Hearn gave Wilder a heads up to say whether Joshua would allow him into the ring, because then he would have come to Cardiff to hype the fight. It was obviously a missed opportunity for Hearn and Joshua by not letting Wilder know that he could enter the ring. ”Alexander Povetkin, Jarrell ‘Big Baby’ Miller, Deontay Wilder or Dillian Whyte,” Hearn said when asked who Joshua will fight next. “He’d fight Tyson Fury next, but he doesn’t want it. The reality is if the Wilder fight doesn’t happen, and they don’t want it on the terms that we believe that are fair, and it’s not a case where we’re going to be disrespectful. We’ve just got to tell the truth, and then we have to fight someone else, and if we have to fight someone else and we have to fight a mandatory and we have to fight in America, then that’s fine,” Hearn said. Most boxing fans believe Joshua’s next fight will be against ‘Big Baby’ Miller, because he’s clearly one of the best American fighters in the country and he’s right up there with Wilder when it comes to his ability to market his fights. Miller has a lot of talent with hyping his fights, and Joshua will get a lot of attention fighting him. Miller also has the size, work rate and punching power to give Joshua a hard fight. With his power, engine and size, Miller is more of a threat than Parker was for Joshua. Joshua will probably need to box Miller for 12 rounds to have a chance of beating him. It won’t hurt if there’s a referee that prevents inside fighting like the one we saw last Saturday. That referee would be perfect for Joshua to beat Miller, because he likes to work on the inside. If the referee pulls Miller away from Joshua all night long when he’s trying to fight in close, it’ll be an easy win for AJ. It’ll look bad for Joshua if his fights continue to have referees that stop his opponents from fighting on the insider, but he probably won’t lose any sleep over the criticism he receives from the boxing public. ”Povetkin-Joshua is a really great fight. It’s a really tough fight. Even tonight, the pay-per-view buys were huge,” Hearn said. Hearn sounds like he’s tipping his hands in letting the fans know that he’s very interested in making the Joshua-Povetkin fight.